Depending on which side of the world they're on, it could be tomorrow for them. So login rewards use the player's local time, as opposed to stuff like the daily activities which follow server time? Our guildies in Australia (and similar time zones) are unlocking as well. They're a day ahead. Interesting. Weird. Thanks for the info, guys. Daily individual activities also use local time. Only guild daily activities use a set time for everyone... because they have to. Guess I was thinking of Events, actually. I'm just used to seeing Event characters be unlocked by everyone around the same time of day, everyone in guild seemingly getting their characters refreshed at the same hour, etc. So the big question! 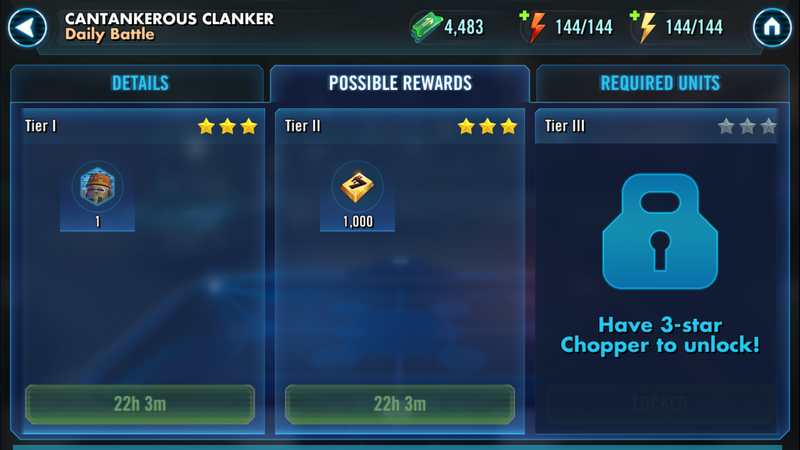 What's the rewards for tier 2 chopper event? After researching this for you, all I can come up with is he's a clantankerous clanker. Australia lives in the future. That way, if the world blows up or there's a zombie apocalypse, they can warn the rest of us. I am going to interpret this as a coded message which really means "Phoenix are the new meta, Chopper is extremely OP, and the sooner you have him the bigger your advantage." Should've created your SWGOH account with a Australia address, you'd kind of have an advantage with rollouts and/or updates.